Will Karki be able to protect the legacy of Koirala's? ITAHARI, Dec 3: In the legislative elections of 1959, BP Koirala got elected for the first time from constituency no. 5 of Itahari which is now the district's constituency no.4. Later Girija Prasad Koirala became successful in protecting the legacy of Nepali Congress (NC) by emerging victorious in 1991 and other elections. 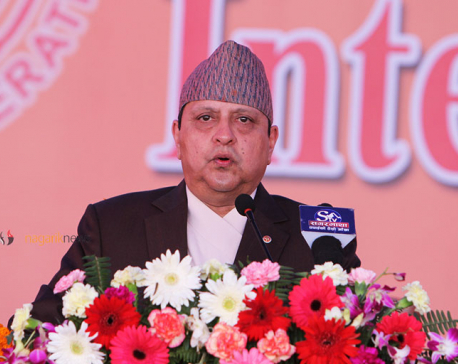 However, this time, the party has fielded the sitting Minister for Finance, Gyanendra Karki for the electoral battle. Locals are keenly waiting to see whether Karki will be able to protect the stronghold of the Koiralas or lose it to other parties. Girija Prasad bagged the victory in constituency no.4 in 1991 and constituency no. 5 in 1994 and 1999. It is said that caste-based votes are decisive in this constituency. The Muslim community widely supported Girija Prasad during the elections. Unfortunately, his daughter Sujata Koirala had to face a defeat in the same area in the elections of 2008. Upendra Yadav, Chairperson of Sanghiya Samajbadi Forum Nepal (SSFN) got elected twice in the first and second constituent assembly elections. BP often ran his political campaigns with popular Muslim leaders such as Khalil Miya, Maksud Ansari, Nakchedi Miya among others. While Girija Prasad often forwarded Muslim leaders into politics. "The Muslim community has an emotional bonding with NC," said Mohammad Mustakin who is running an election campaign in Koshi Rural Municipality. There are about 30,000 Muslim voters in this constituency. There is an equal number of active Muslim leaders in the CPN-UML and other Madhes based parties too. "But only those who can spend a lot of money can win the elections here," said Israyal Mansuri, CPN-UML leader of Koshi Rural Municipality. CPN-UML candidate Ramesh Shrestha and NC's Gyanendra Karki both have speeded up their electoral campaigns in an attempt to woo the Muslim voters. After Muslims, Yadavs are the second biggest community while other castes make the minorities in the constituency. In the elections of 1999 and 2008 NC's Karki had to face defeats with a low margin. However, this time, he is all set to avenge his defeats. According to him, he decided to file his candidacy as he wants to dedicate himself to serving the people of Sunsari. On the other hand, CPN-UML's Shrestha is the eldest son of former home minister Hom Bahadur Shrestha. A year ago, he switched to the CPN-UML from Rastriya Prajatantra Party (RPP) and is trying to save the legacy of his father and uncle Dil Bahadur in the district. Similarly, Ram Narayan Yadav of Rastriya Janata Party Nepal (RJPN) is expected to win the majority of votes from the Yadav community. Although the nominations of all the other constituencies have also paved the way for an interesting electoral battle, locals are found more eager for the results in constituency no.4. Meanwhile, with the objective of winning the elections, parties are lobbying to bring the voters across the borders. As many as nine wards of Koshi and Harinagara Rural Municipality which fall under constituency no.4 are attached to Indian borders. A lot of parents marry their daughters to Indians across the border but their names are still listed in the voters' list here. So, the political parties are making efforts to bring such voters to the elections before December 4 as borders will be sealed 72 hours before the elections to ensure security.